Mr Taylor, 75, and his wife Rosemary were part of a small group of winners who got the rare opportunity to attend a VIP reception with the famous couple. They chatted and had their photographs taken. The event, which was attended by George and his wife Amal Clooney, was a celebration of the vitally important work done by all the charities, which are supported by players of the lottery. “I didn’t go weak at the knees, but it was a privilege to meet him and Amal. The trip to the Charity Gala in Scotland was a welcomed break for Mr Taylor who is in remission from prostate cancer. He was diagnosed with the disease in the months after his lottery win, which he spent on a new heating system for his home on the coast. 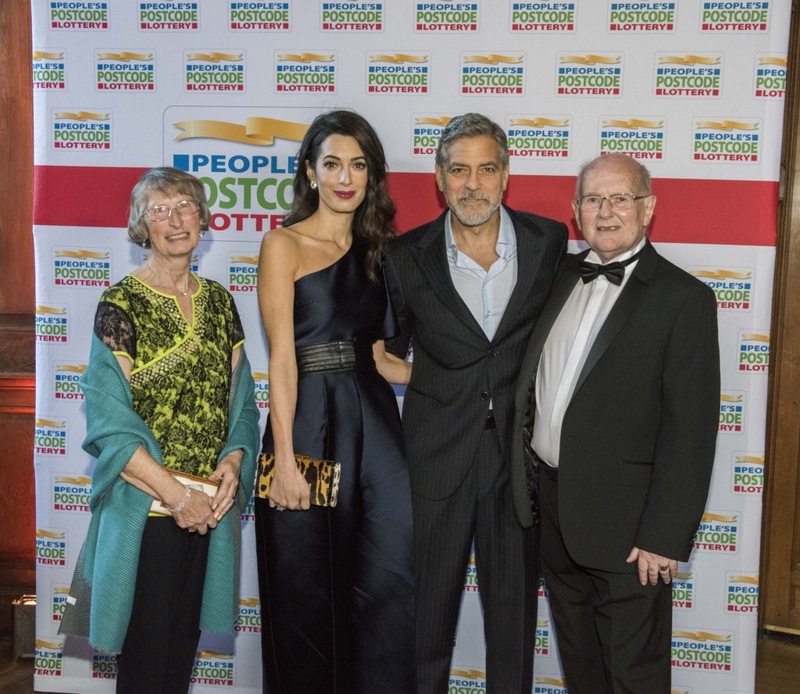 On the night, the Clooneys also received a cheque for £1million raised by players of People’s Postcode Lottery. The money will help fund TrialWatch - a project run by the Clooney Foundation for Justice. The Foundation now plans to increase its monitoring of trials in countries where human rights are at risk. Clara Govier, Managing Director of People’s Postcode Lottery said: “I’m glad George and Rosemary had a great night. A Rosemary and a George. It was destined. But Rosemary looks a bit left out. Amal should have done a better job of including her, instead of letting her look tacked-on. Do you get the feeling Amal's holding George (Clooney) up in that picture? He's looking a little hunched over there - back pain again maybe? Well, I wasn't going to say anything, but her left arm looks tense and sharply angled, more of a pose or positioning than a spontaneous gentle touch. So, maybe so. George could also just be in the awkward position of looking chummy with Other George while also being obligated to photograph "loved up" with the wife.